Prosecutors are investigating a complaint filed by the Korea Internet Media Association against footballer Jong Tae-se of the Suwon Samsung Bluewings. The association, which is headed by rightwing pundit Byun Hee-jae, accuses Jong of violating the decades-old National Security Law by voicing support for North Korea, for which he played in the last World Cup. The Suwon prosecutors' office said it has to investigate since it received an official complaint. The association is upset by remarks Jong made in interviews with the foreign press in the past such as, "I respect [ex-North Korean leader] Kim Jong-il and I trust and follow him," and "My fatherland is North Korea." Jong, who is second-generation Korean-Japanese, holds South Korean citizenship because his father does but went to schools in Japan run by a pro-North Korean organization called Chongryon. 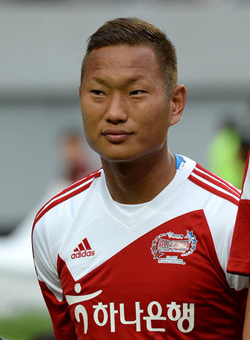 He joined the North Korean national football team in 2007 and played for the country in the 2010 World Cup in South Africa. At the time, Jong earned permission to represent North Korea despite his South Korean citizenship thanks to mediation by FIFA and was also given a North Korean passport. This fact emerged while Jong was signing his contract with Samsung Bluewings early this year, and some football fans campaigned to have Jong banned from playing in the South Korean league.